Water your crops by day, conduct experiments by night. Verdant Skies is set on the fictional planet Viridis Primus. You're a new colonist launched in from the home planet, helping to make the young settlement a financial success by maintaining a farm of local crops and shipping the goods home. It has all the staples we’ve come to expect from the farming life genre. You’ll spend time tending your crops, fishing, furnishing your home, and befriending and romancing your fellow settlers. At first glance, I thought it would be just another casual farm sim, dressed up in sci-fi clothes. Crops have space pun names. The animals look like Pokémon. Everyone who shows up to help colonize has a science-y space job. Thank goodness I was wrong. With a system that transforms you from an agriculturalist into a genetic engineer, Verdant Skies trades rural charm for the allure of science. You won’t be buying the exact same crops season after season in Verdant Skies. Instead you’ll become your own seed scientist, creating better crops from your existing ones. Your initial arrival on Viridis Primus is less than auspicious. After your ship crashes on the surface, you discover the contract you didn't bother to read binds you to pay for the damage. Verdant Skies' proxy for a town mayor is Jade Worthington, whose title is 'administrator' but whose fashion choices say 'space goddess'. Despite her flashy appearance, Jade is a relentless taskmaster with no patience for slacking. She encourages you to help the settlement prosper so you can pay off your debt. After your first few orders of business, other characters begin to join your settlement. Before the end of summer, you'll likely have an engineer, botanist, shopkeeper, and biologist, with more to follow. The mechanic that makes Verdant Skies different comes to light with the help of resident botanist Wyatt Jones. After planting and reaping your first few crops, you'll be able to use the seed extractor. Each seed can have up to several distinct traits, such as improved quality, the ability to regrow after being harvested, or less-desirable ones like needing fertilizer to grow. Next, you’ll be introduced to the genetic combiner, which uses two existing seeds to create a new one with qualities from both parents. After inserting two parent seeds, you use a sliding scrubber to determine a splice point that results in your desired traits for the offspring seed. You won’t be buying the exact same crops season after season in Verdant Skies. Instead you’ll become your own seed scientist, creating better crops from your existing ones and tinkering to find a crop that best suits your farm. 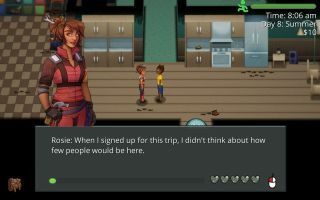 A mechanic like that is always someone’s darling, so I went to Verdant Skies’ lead programmer, Andy Korth of Howling Moon Software, to ask about it. He explained that the inspiration for gene splicing was the genetic crossover algorithm, the process by which biological traits can be passed from multiple parents to a single offspring. The goal with the genetic combiner was to create something that a casual player can mess around with and still attain decent results, while also allowing others who really engaged with the system to do a lot more. "It's a mechanic where a player can sit down and plan out multiple splices with a specific end goal in mind," he says. "You can get really into it and optimize different strains of each crop for different goals, like having a low-maintenance crop that you can plant and forget." My own end-goal was just that, after figuring out what the splicing system could do. My dream crop is now one with the regrowth trait, increased growth speed, high quality, and a set of automated sprinklers that I can leave to grow on their own until I come to collect it every few days. When you first see it, the genetic combiner can be a bit daunting. Andy explains that the design has already gone through several iterations while searching for the right balance, with more changes to come. "The big challenge was how to present the information. The genomes are a set of 16 genes which is a big enough number that it's pretty tough to absorb that information at a glance." After testing with community members and players at conventions, they found a sweet spot not only for the genetic combiner, but the rest of their mechanics as well. "I think a really great design ideal is for a player to be confused by a mechanic for just about five seconds, then say 'Oh, I get it!'" According to Andy, the gene-splicing mechanic will be coming to your extraterrestrial livestock as well. On the subject of how animal traits will differ from those of plants, he says, "There are some fun animal-specific ones, like how much food they eat, what kind of food they eat, and what their attitude is like. Due to popular request, you can walk them around on a leash." Verdant Skies looks like it will be a creative spin on the farming life genre. It has a lovely, hand-painted art style and all the normal fare we expect from casual farming sims, but the addition of genetic manipulation is what's likely to make it a superior specimen. Verdant Skies is currently in development without a set release date, but you can follow its progress on the development blog.